The Rev. David García, San Antonio’s Archdiocesan Director of the Old Spanish Missions, will speak on campus Jan. 25 about the missions’ historic works of art. “The Faith of the People in the Art of the San Antonio Missions” – open to the public and media – will be held at 7 p.m. in Conference Room A of the University Center. García will explain how traditional art created by indigenous peoples was an expression of their religious faith, and how the mission art brought the new faith and traditional art forms together. Those traveling to campus are asked to park in Lot D, near the NW 36th Street entrance, or Lot H, near the Culebra Road entrance. García is pastoral administrator of Mission of Concepción. Together, the four Missions – each an active parish church – are part of the San Antonio Missions National Historic Park. They, along with the Alamo, were named a UNESCO World Heritage Site in 2015. García also serves as Catholic Relief Services’ national Senior Adviser for Clergy Outreach. Before taking on his current roles, he was rector of San Fernando Cathedral from 1995 to 2008. With the Archdiocese of San Antonio, he has served as Secretary to the Archbishop, Director of Administrative Services, Vocation Director, Interim Rector of Assumption Seminary and Seminary Formation Faculty Member. He began his ministry at Immaculate Conception Church as vicar and then pastor. 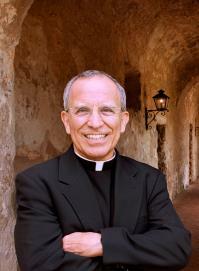 García earned a bachelor’s degree in History from St. Mary’s in 1971. He also has master’s degrees in Theology and Institutional Administration from the University of Notre Dame. He was a Charles Merrill Fellow at Harvard Divinity School in 1994 and a Merrill Fellow at Notre Dame from 1972 to 1974. The Catholic Intellectual Tradition Lecture Series is a free, annual series featuring men and women who have shaped the Catholic intellectual tradition at the heart of the educational enterprises at St. Mary’s. The theme for the 2017 series of four lectures is The Art of Faith, and features speakers from various faith traditions. For more information, call 210-431-8094.